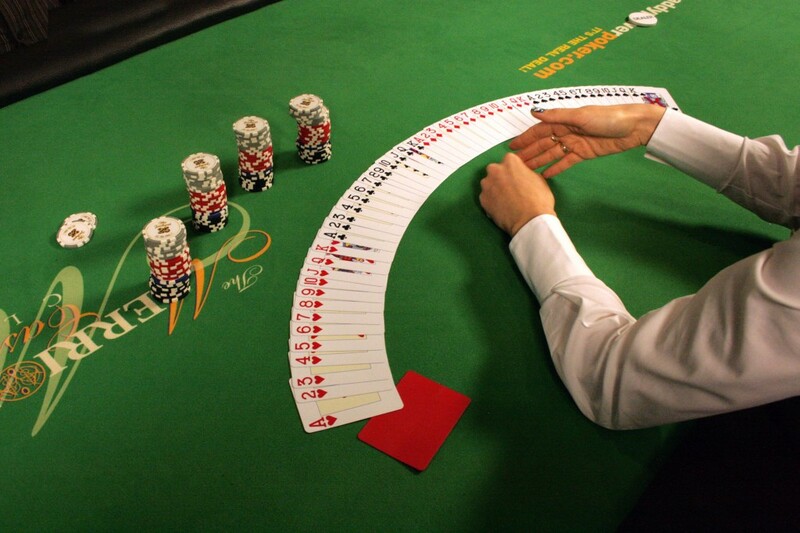 In his book The Theory of Poker, David Sklansky, who is described as “the number one authority on gambling in the world today,” presents to the reader his ‘Fundamental Theorem of Poker’, a unified stratagem for a more intellectually-minded poker player. The theorem states: Every time you play a hand differently from the way you would have played it if you could see your opponents’ cards, they gain; and every time you play your hand the same way you would have played it if you could see all their cards, they lose. Conversely every time your opponents play their hands differently from the way they would have if they could see all your cards, you gain; and every time they play their hands the same way they would have played if they could see all your cards, you lose. Sklansky’s theorem is tailored to the combative environs of the poker table, but there is much that can be extrapolated from it in terms of practical existence. Sklansky wants us to imagine that life includes a vista from which we can peer both forward and backward upon the decisions we make. If the end results of our choices were knowable, would we still do the things we do? Defeat is not to be countenanced, but what is far worse for a poker player is regret. Life in a market economy may be a game of chance, but it is not a game of poker. In a game of poker, there is a single winner and everyone else leaves the table with nothing. The odds are stacked differently away from the table. The financial calamities of recent years have taught us that the house will absorb even the most outrageous losses of its wealthiest players when they threaten its own existence. For all the populist rage summoned by the Irish media over the nefarious behaviour of the country’s banking sector (Exhibit A, the Anglo Tapes), there has been no reckoning for the financial classes who ruined Ireland. The fools are the suckers who bought the lie. The peddlers of the lie, its architects, have simply gone to ground or scattered—to Connecticut (Sean Dunne) to Cape Cod (David Drumm) to Fermanagh beyond the reach of the state (Peter Darragh Quinn) to England where the bankruptcy rules are less onerous. And there they seem to be waiting for the tide to roll back in. What is at risk when there is nothing tangible to be lost? Like many of us who have never gambled our livelihoods on a single decision, Michelle Browne is intrigued by the compulsive, reckless thrill of risk, as well as its subtle physical manifestations. 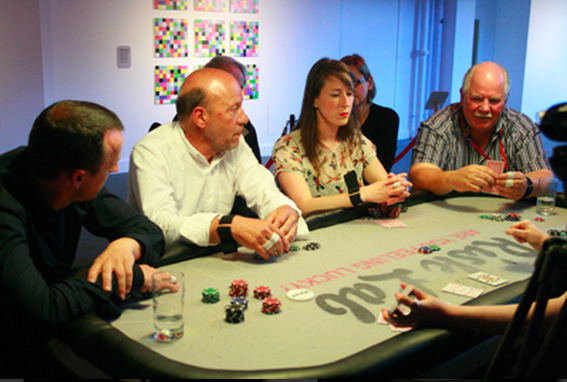 In her piece called Risk, staged at the LAB from 18 October–3 December, 2011, and at the Science Gallery from 2 May–23 June, 2013, she presents a series of conversations with (seemingly) wealthy men around a poker table. These are polite, detached, reflective conversations, shorn of the sniping and scorn common when men gather to play to talk business or play cards. The players give away far more than they intend. Over the various incarnations of Risk, we are introduced to many important men in Irish society. We meet Peter Stewart, chartered accountant, public accountant, financial director, and a director of NAMA and chairman of its Northern Ireland Advisory Committee, from its creation out of the ashes of the Celtic Tiger until late 2011. We meet Michael Dawson, a former senator, Fingal Business Person of the Year, and founder of the Gift Voucher Shop and One4All gift cards, a company leading the gift card and voucher market in Ireland, the United Kingdom, and Malta. We meet Simon Kelly, failed property developer and author of Breakfast With Anglo, a man whose introspective streak and forthrightness in apologising for financial recklessness almost makes you forgive him for the €1 billion of debt he and his partner accrued in 2008. We meet other wealthy men from a class in Irish society who rarely speak outside of their own business and social circles. These are privileged conversations with elite men who openly discuss many of their mistakes in business within the context of the Irish economy. Like business, poker is also often a dramatised, public act of deception, and Browne provides viewers with an ingenious way to peer into each player’s psyches as they bluff and bet. Each player is connected to a GSR skin conductance device that measures moisture levels on the flesh, which is itself connected to an animated video of a chair that moves back and forth (filmed on a motorised model in its first version, utilising photographic stills in the second) in accordance with the amount of sweat their body is producing. 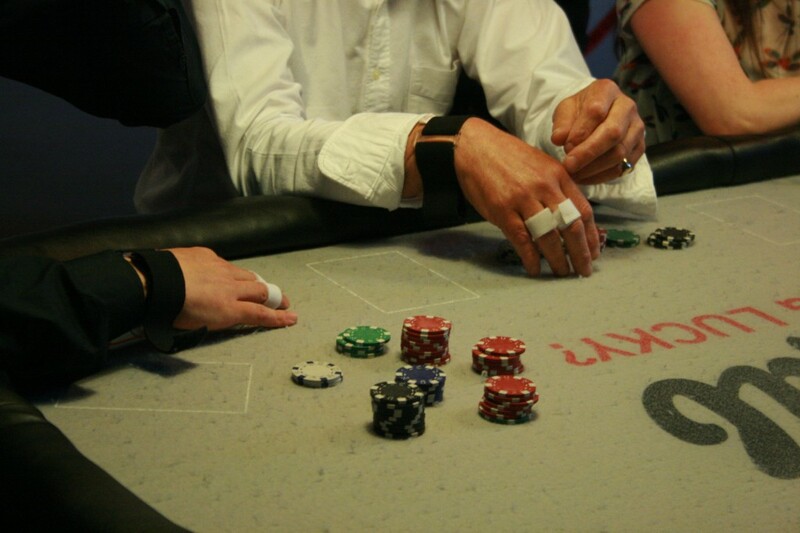 Here is the underside to the polite decorum of the poker table. The sweat glands are controlled by the sympathetic nervous system, which looks after our fight-or-flight instinct. Skin conductance intrigued early psychoanalysts like Jung and Reich and is one of three of the principle functions for polygraph machines. The charge released by sweat is its own code and in the language of poker, a tell, one that cuts far deeper than the scratch of a nose or a sly smile. Passersby could view the teetering chairs on monitors nearby the live game (in the LAB they were beside the table and in the Science Gallery they were stacked chairs on top of the game) and make up their own minds. (Indeed viewers could even try the sensors themselves when the games weren’t being played to get a deeper insight into their own lying). “I think this risk thing is kind of retrospective,” Kelly said in one game. “The idea that you could control these risks …” He says people asked him if they’d risk-assessed his decisions, but adds that no one could have predicted the banking system would “vanish”. Which sounds sensible enough, except that the history of capitalism is littered with examples of market meltdowns that leave banking systems poised on existential ruin: the 1637 Dutch Tulip bubble; the 1720 South Sea bubble; the panics of 1819, 1837, 1847, 1857, 1884, 1893, and 1896; hyperinflation in Germany after the Treaty of Versailles; Black Tuesday in the United States and the Great Depression that followed. What is blatant from these discussions is that a person with a true appreciation of risk is a person who is unfit for work at the highest levels of financial circles. True success is measured not merely in net worth, but in one’s ability to gamble it foolishly toward an even greater sum. As one player says, it’s not failure but fear of failure that is the true inhibitor for men of wealth. Bizarrely, many of the true legends of finance are those who risked it all only to fail spectacularly. Failure has its virtues; never more so than in an economic system that will willingly thrust the debts of the speculative upon the shoulders of the masses. As J. M. Keynes wrote in 1930 in ‘Economic Possibilities for our Grandchildren: “The love of money as a possession—as distinguished from the love of money as a means to the enjoyments and realities of life—will be recognised for what it is, a somewhat disgusting morbidity, one of the semi-criminal, semi-pathological propensities that one hands over with a shudder to specialists in mental disease.” His own grandchildren would tell him that he was wrong. The pursuit of money for its own sake remains one of the factors that drives capitalism forward despite the occasional protest on the periphery. The men Browne meets may be reflective about the decisions they’ve made, but it is clear there is no other way. No other system they would prefer or will into existence. Donald Mahoney is a Dublin-based writer and journalist.